If you’ve noticed a blackberry or raspberry with white drupelets, then it likely suffers from White Drupelet Syndrome. What is this disorder and does it hurt the berries? A drupelet is the individual ‘ball’ on the berry fruit that surrounds the seeds. Occasionally, you may find a berry that appears white in color, especially on its drupelets. This condition is known as White Drupelet Syndrome, or disorder. White Drupelet Disorder can be recognized by a tan or white discoloration of the drupelets on either blackberry or raspberry fruits, with raspberries being the most commonly affected. While a blackberry or raspberry with white drupelets may be unsightly, the fruit itself is still usable and relatively safe to eat. However, it is usually deemed to be unacceptable in commercial markets. 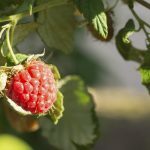 What Causes White Spots on Raspberries and Blackberries? There a few possible reasons why this happens. The most common reason for blackberries and raspberries with spots is sunscald. Berries that have full exposure to hot afternoon sun are more susceptible to this disorder as hot, dry air allows for more direct UV rays to penetrate the fruits. Higher temperatures, and even wind, can trigger this response as well. When sunscald is associated with White Drupelet Syndrome, the side of the fruit exposed to the sun will be white whereas the shaded side will remain normal. Pests may also be responsible for the white spots in berries. Damage from stinkbugs or red mites can often lead to white drupelets. 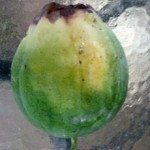 However, the discoloration caused from feeding damage will look quite different than that of sunscald or hot temperatures. The drupelets will take have a more random patterning of white spots rather than a large general area. 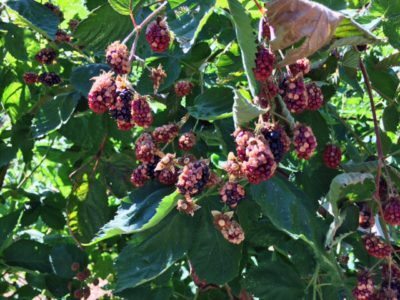 While most varieties of blackberry and raspberry plants are susceptible to White Drupelet Disorder, it seems to be more prevalent with ‘Apache’ and ‘Kiowa’ as well as ‘Caroline’ red raspberry. To prevent white drupelets, avoid planting in sunny areas that are prone to hot summer winds. It may also help to orient your rows in a north-south facing position to minimize the effects of sunscald. Shading may be helpful as well; however, it is recommended only after pollination has already occurred. While still questionable, using overhead watering twice a day to cool plants during hot weather (for 15 minutes between morning and afternoon) is thought to help alleviate sunscald. The limited watering cools the plants but evaporates quickly. This method is not recommended in evening hours as there must be adequate drying time in order to prevent the onset of disease later.